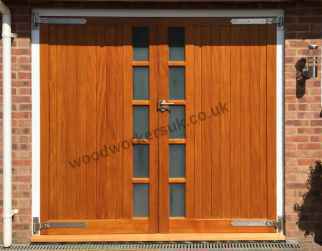 Looking for side-hinged wooden garage doors that will actually last? Quality you don't get 'off the shelf'! We are British Woodworking Federation Code of Conduct Assured! Trying to match an existing garage door design or got a sketch of something you want? We use a full width mortice and tenon joint which is secured by wedges and glue (through wedged morticed & tenon jointed) – old school. 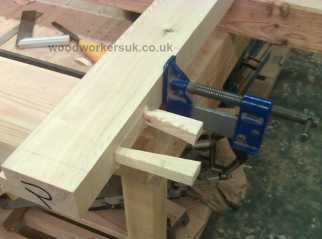 We don’t use a dowelled mortice & tenon joint – the dowel fails and lets water in. Put simply we make our garage doors to last. 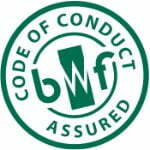 We’re BWF Code of Conduct Assured – the BWF have checked references, rigorously inspected our work and we are actually joiners (they even check our qualifications as well) – so you can make your own mind up. 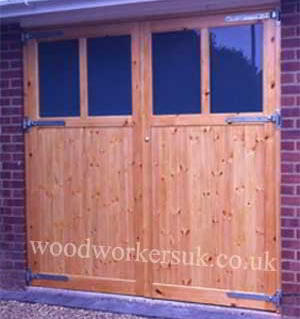 Our wooden garage doors are available in softwood (Scandinavian Redwood) and hardwood (European Oak, Meranti and Idigbo) unless stated otherwise and are all doors are made to measure (in both height and width). Please contact us with your size requirements for a full personalised costing. Garage door frames are also available if required, these usually are supplied in the same timber as your garage doors i.e. 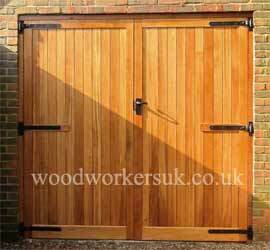 softwood garage doors then softwood frame and hardwood garage doors and hardwood frame. All of our side hung wooden garage doors finish at approx 1 3/4″ / 45mm thick, however if you wish our doors can be manufactured at 2 1/4″ / 58mm thick if for instance you would like to put thicker glazing within our doors. All garage doors pictured below are our standard designs, all can be customised if your requirements differ – please see our custom garage doors page. 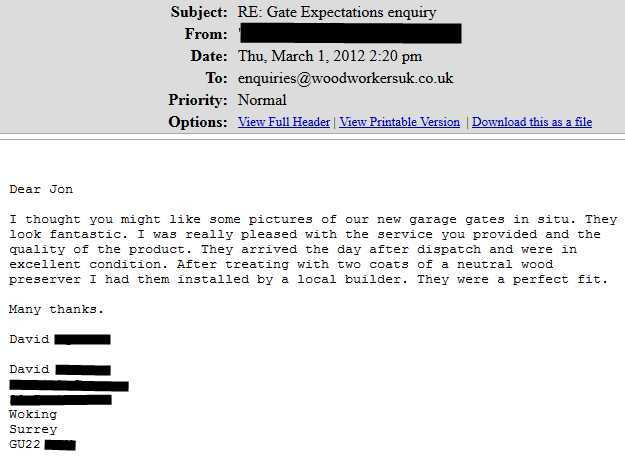 Please note: We do not manufacture ‘up and over garage doors’. 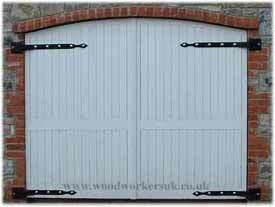 Our timber garage doors are suitable for outbuildings as well as garages. Outbuilding doors are made-to-measure and can be supplied with a door frame to suit your outbuilding if required. Each set of doors is built for security and longevity, and as you can see below, their appearance fits well with various types of building. 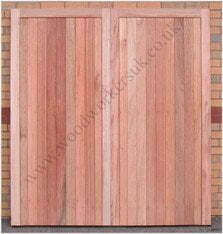 Pictured is our marvelous Menai timber garage doors in softwood. This is available made to measure in smooth planed softwood (Scandinavian Redwood) and hardwood (European Oak, Meranti and Idigbo). This door is a real feature for your home. The Menai wooden garage doors feature sturdy solid full thickness top, centre and bottom rails for rigidity and longevity. Pictured is our Alyn wooden garage door in Idigbo (Hardwood). This features solid top and bottom rails, and a discreet hidden centre rail, which is only visible from the rear of the door.This solid door would add security to any garage or out-building. Let the beauty of natural wood doors add value to your home.The Alyn are available made to measure specifically for your opening sizes, in softwood (Scandinavian Redwood) modified softwood (Accoya) and hardwood (European Oak, Meranti and Idigbo). 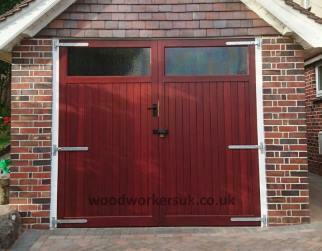 Our Clwyd garage door pictured in Meranti (hardwood). These are also available in European Oak, Idigbo (hardwoods) and Scandinavian Redwood (softwood). The Clwyd wooden garage doors feature sturdy solid top rail, and hidden centre and bottom rails – the centre and bottom rails are only visible from the rear of the doors only, so your neighbours will only see the beauty of the wood. The Clwyd doors are only available in overall widths of up to 8′ (2440mm), each door being a maximum width of 4′ (1220mm) wide. Need your garage doors delivering? As well as our range of fully boarded garage doors, we also have a selection of garage doors with windows. All the doors below are supplied pre-beaded, so no fiddling around searching for a source of glazing beads or getting messy with putty. All the garage doors below are ready for glazing and the supplied with the glazing bead pre-fitted (no cutting!). Glazing bead is fitted internally for added security, so when you do come to fit your glazing it goes in from the inside of the doors. If you’re looking for a more contemporary looking garage door then our Snowdonia garage doors may be right up your street. The Snowdonia features one row of five vertical openings (per door) for glazing that sit on the meeting stiles (where the two doors meet) of the doors. Available made to measure in Hardwood (Euro Oak, Idigbo, Meranti) and Accoya (Modified Softwood) and Scandinavian Redwood (Unsorted Softwood). Our Conway hardwood garage doors shown in Idigbo (Hardwood) with solid bottom rails. This beautiful door features six Georgian style openings for glazing in each door. Can you imagine this on your garage or out-building? This classic design is also available in European Oak, Meranti (Hardwoods), Accoya (Modified Softwood) and Scandinavian Redwood (Softwood). The openings for glazing are beaded internally (supplied pre-beaded). Please note, glazing is not supplied. 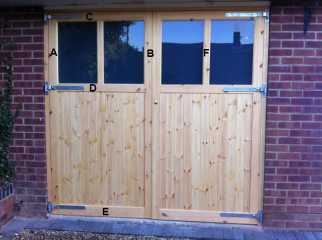 Pictured is a pair of our Brenig made to measure garage doors in Softwood, with solid bottom rails. This design would offer security and privacy for any garage or out-building, as well as allowing sunlight into the building through the glass panels. Manufactured with security in mind the doors are beaded internally (supplied pre-beaded) glazing is not supplied with the doors. The Brenig garage doors are also available made to measure in hardwood (European Oak, Meranti and Idigbo), Accoya (Engineered softwood) and Unsorted Scandinavian Redwood (Softwood), and with a bare-faced bottom rail (visible from the rear only). Please contact us with your sizes required for a full personalised costing. 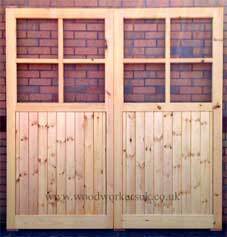 Pictured in Unsorted Softwood are our Elwy garage doors, with solid bottom rails. This design gives both security and privacy for any garage or out-building, as well as allowing sunlight into the building through the glass panels. 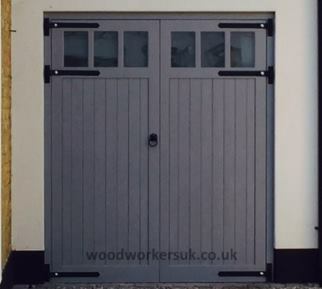 Available made to measure, the Elwy garage doors can be manufactured in hardwood (European Oak, Meranti and Idigbo), Accoya (Modified Softwood) and Scandinavian Redwood (Softwood), and with a bare-faced bottom rail (visible from the rear only). Why not contact us directly to find out more? As with all our wooden garage doors that are available to take glazing, the openings for the glazing are beaded internally (supplied pre-beaded). Glazing is not supplied with this garage door. Our Aber side hinged garage doors; shown in Meranti (Hardwood). The Aber side hinged garage doors are also available in European Oak, Idigbo (Hardwoods) Accoya (modified softwood) and Scandinavian Redwood (Softwood). The openings for glazing are supplied internally beaded and ready to glaze (glazing not supplied). The Aber garage doors would add value and interest to any garage or out-building; and offer a bit more privacy than any other of our garage doors with windows as the glazed area is slightly higher (it does however depend on the height of doors you require!). Like the privacy our Aber garage doors offer, but prefer the top section for glazing a bit more like our Conway garage doors? If so then our Aberconway garage doors may be just the ticket! Based on our Aber doors but crossed with the Conway, the Aberconway comprise three openings for glazing per door with the openings separated by glazing bars giving you the best of both worlds! 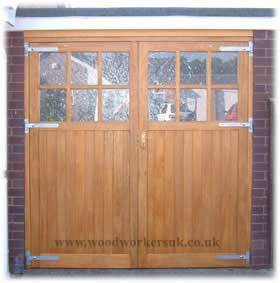 We are also able to offer our garage doors as insulated garage doors. These differ from our standard specifications slightly as they are 58mm thick rather than the usual 45mm thick. From the outside, they look the same as all the above doors; however, from the inside, rather than seeing the back of the boarding and horizontal rails, you see a similar view as you would when looking at the front of the doors because they are boarded both sides. This enables us to ‘sandwich in’ insulation between the two layers of boarding. Our door frames are also available to suit our insulated doors; again, these differ in size to our standard door frames as these finish at 70mm x 85mm (less rebates) rather than our standard door frame size of 70mmx 70mm (less rebates) and are supplied pre-fitted with draft excluder. 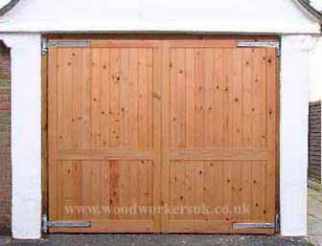 Your wooden garage doors, the way you want them! As well as all being made to the sizes you require, our standard designs of garage doors pictured above can be customised to your exact requirements.For some of the more commonly requested customisations please see our ‘Customise your garage door section. If you’ve something specific not mentioned then please get in touch and we’ll let you know whether it can be done or not. Trying to match an existing pair of wooden garage doors? Got your own side hung garage door design in mind? Then please see our bespoke garage door pair for details on the information we need to manufacture a pair of garage doors to your own design. If you can sketch it, we can make it! 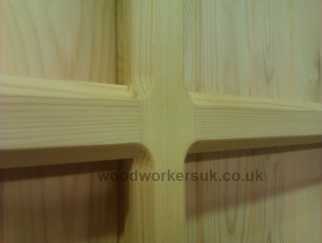 Garage door frames are also available in matching timber as your garage doors. Please contact us for more information. Please note that we do not supply garage door frames unless we are manufacturing you some garage doors. We don’t have a standard size for our garage doors, we make them to suit YOUR requirements – the downside to this is, it is near impossible for us to produce a price list covering all the height and width combinations that we regularly make. To give an idea of cost, below you’ll find some guide prices for our garage doors. Please be aware that these are guide prices only and not starting prices. Please get in touch with your size requirements for a costing of any of our garage doors made to suit YOUR opening/s. Local to us or want to collect from our workshops? No problem, please get in touch with your requirements! We are very pleased with the beautiful gate that you made for us.I have attached a photo of it for you to see.At last we have painted it and hung it! Just to let you know that the garage doors are now in and painted and look fantastic. Do you require a garage door frame? So how do we make our wooden garage doors? 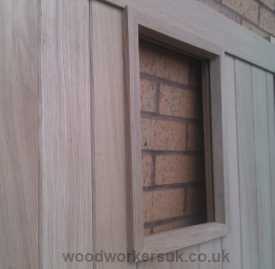 Well all of our garage doors are based on a through, wedged morticed and tenon jointed frame – we make them to last! All of our doors, with the exception of our Clwyd garage doors have a full thickness, 145mm / 5 3/4″ high solid bottom rail giving unbeatable strength – if you look at the doors from either the front or back you will see this bottom rail. As standard our garage doors have rebated meeting stiles, in plain speak when closed the two doors in effect overlap. 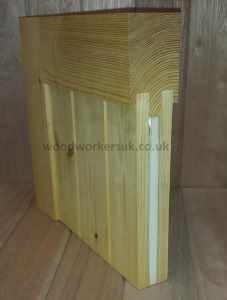 Our Clwyd garage door is very much our economy door, it is still based on a through, wedged morticed and tenon jointed frame but does not have a full thickness bottom rail, instead it has a bottom rail that is 150mm/6″ up from the bottom of the door and the rail can only be seen from the rear of the doors. Our standard range of garage doors all finish at 45mm / 1 3/4″ thick, we won’t make a door thinner than this – however if you’ve got specific requirements and want a thicker door then please get in touch. The garage doors start out as rough sawn timber, this is cut oversize (height, width and thickness) and planed up – at this stage the timber if needed is straightened (trees don’t always grow straight!). Each job is then marked up individually, in the case of a customer ordering several different pairs (at different sizes) of say our Conway doors (or any of our garage doors with windows) we’ll quite often give you a ring at this stage to discuss the sizes of the openings for glazing – as we do try and get the openings for glazing as near as possible the same sizes in the different pairs. Once marked up the doors are ready for jointing, as we’ve mentioned above all rails are tenoned and the stiles (vertical outer uprights of the doors) are morticed out. Mortices go right the way through the stiles (we don’t and will not manufacture our doors on a stub tenon joint – this is where the mortice only goes part of the way through the stiles of the doors, this results in easier to make doors but the length of the tenon is reduced thereby giving you a weaker door where the joints will more than likely fail). Tenons length is the full width of the stiles, so when jointed up the tenon goes right the way through the stiles and can be secured with wedges (and glue). The doors are then put glued, put together and wedged up naked, with no boarding added at this stage and then left to dry. At this stage any glazing bars are also glued into the doors. Once dry the boarding is then added to the doors, wherever the boarding meets a solid, full thickness rail it is glued and jointed into the rail – we do not sit the boarding in open rebates (if we were to do this, then with the natural movement of timber you would soon be showing gaps where the boarding moves). One of our Menai garage doors that has been glued up and is awaiting boarding. 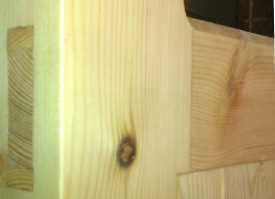 The boarding in this door is jointed and glued into the top rail, centre rail and bottom rails. Whenever glazing bars meet each other, they are halve jointed together. The picture above is from our Brenig garage doors. On any hidden rails (rails you can see only from the rear), the boarding sits on these and is glued and fixed to the rails. So for example in our Alyn framed ledged and braced garage doors, the boarding is jointed into the top rails and bottom rails of the doors and is fixed to the hidden centre rail. 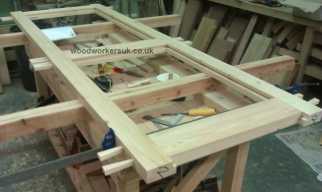 Once the doors have been boarded, the diagonal braced are fitted to the doors, the purpose of these is to take the weight of the doors and spread it through the door to the bottom hinge – this is why the bracing should always point down to the bottom hinge. The only thing that is then left to do is sand your garage doors, we sand the doors three times – belt sand, orbital sand and then finish the doors off by hand sanding the arrisses (sharp edges) off. Whether you chose a softwood garage door or a hardwood garage door we make them exactly the same way – we do not skimp on the doors just because they are ‘only softwood’. We’ve added this section to make it easier for you if you want to customise your garage doors. Rather than say I want the ‘thingy rail’ a bit lower/or higher you can see exactly what it’s called, so we know exactly what you mean! A – Hanging stile: So called as it is the side of the doors that take the hinges. F – Mullion: Splits the glazed section in half. So how do we make our garage doors? We make them to last!